“After previous successful installs, KMH were asked to supply and install a new solution to connect a Major Out of town store to a Temporary Christmas store for a major UK retailer. 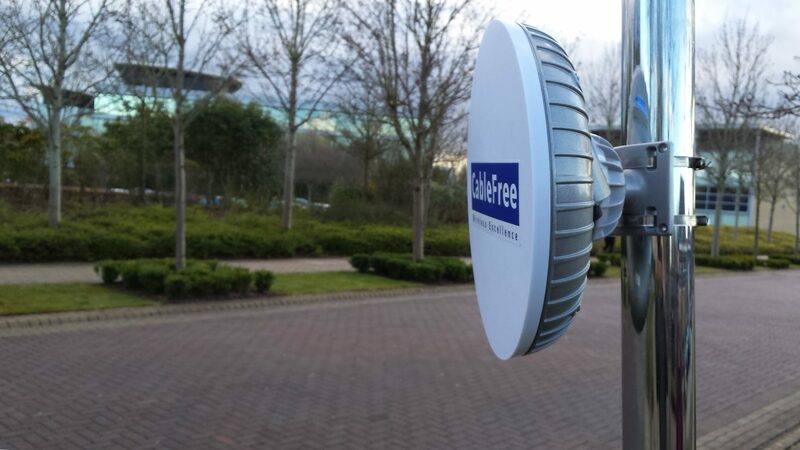 Using the Cablefree Pearl Point to Point solution, KMH were able to install a cost effective, reliable and secure network link between the stores at a distance of 150m without the need to dig up roads or run cabling across the retail park, saving time on the completion of the install. The links were mounted onto the outside of both shops, and we completed the internal cabling back to their IT network internally. The use of the link meant that we were able to deploy the solution in a few days and have the store up and running.The CableFree Pearl is a high performance MIMO radio from Wireless Excellence, with high performance, carrier-class broadband radio equipment with throughput up to 867Mbps in licensed or unlicensed bands. We have been utilising Cablefree point to point links for around 20 years, they have great products which you can rely on. Article content reproduced with kind permission of KMH Group. All content (C) KMH group. Link to original article here.